I first “met” J.H. Bográn back in 2015 when he interviewed me for The Big Thrill. I immediately checked out José’s own fiction, of course, and admired greatly, and we’ve been corresponding back and forth over the years since. 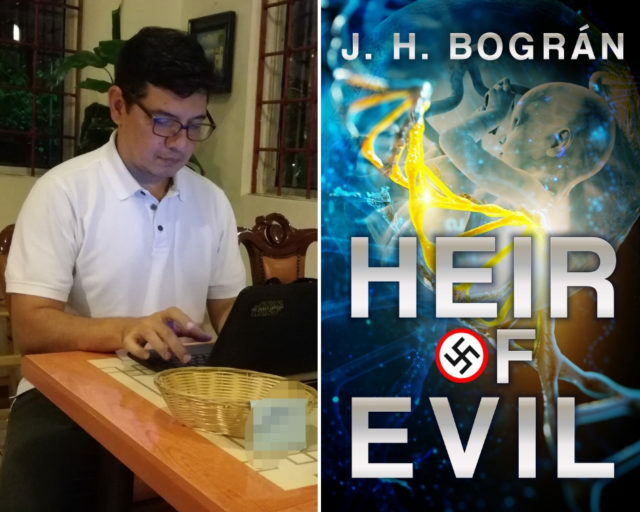 After all the kind attention he gave my own novel several years back, I’m pleased to help spotlight Heir of Evil, his new novel, here today—a special First Two Pages in that it deals with two specific challenges: one about continuing a series and the other about writing against the backdrop of recorded history, in this case, the history of Adolf Hitler. Check out the essay below for a preview of these challenges and an excerpt from Heir of Evil. And check out José’s other work at his website here, on his Facebook page, at Twitter, or on Goodreads—and be sure to sign up for his newsletter too! House of Clues Valentine’s Contest!